Russian сostume. Collection of the Russian museum. 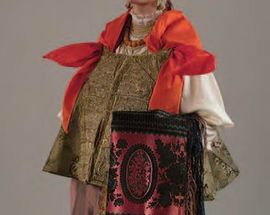 Traditional Russian clothing is different from clothing of other countries of the world and even from the neighboring countries and can be rightfully called part of Russia’s artistic culture. 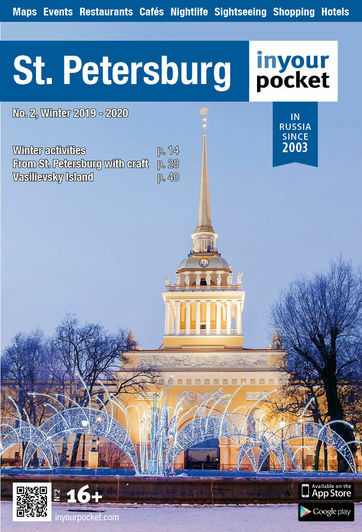 Elements of pagan culture of the ancient Slavs as well as Old Rus’intertwined with regional artistic and craft traditions to form a unique costume of each geographic area. 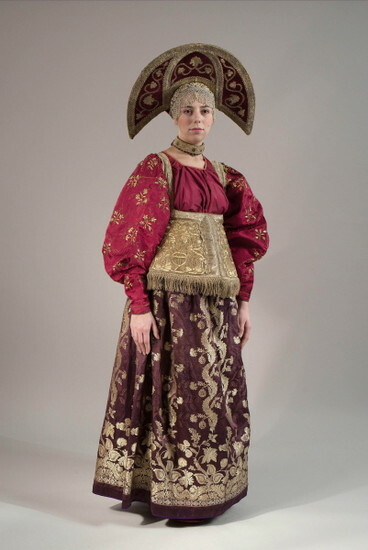 Two sets of clothing were most common for women around Russia. The first one was a women’s shirt with a skirt and a headdress (“soroka”) and was especially popular in the southern regions of Russia. Here, women wore a long linen shirt, on top of which they wore a skirt (“poneva”). In the front they wore an apron and on top they then put on some additional items – “nasov”, “navershnik”, etc. Women always wore a traditional headdress called the “soroka”, which completely hid the hair. The second typical set for women consisted of a women’s shirt, sundress and a “kokoshnik”. This set was common in the northern regions of Russia, the Volga region, the Urals and Siberia. 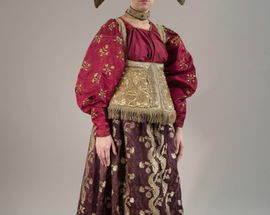 Over a long shirt women would put on a sundress and on top of that a short chest clothing on straps called a “dushegreya”. Married women, as well as women in the south, wore a headdress known as the “kokoshnik”, which completely covered the hair. Hair was considered to have magical powers in the ancient times. It could be used to harm women and children so in order to avoid any misfortune, women carefully hid their hair. 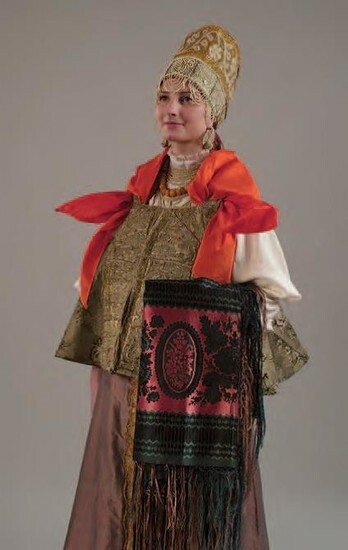 Married women wore “sorokas” and “kokoshniks” to fully cover their hair. Russian girls wore wreaths and headbands, leaving open a crown area of the head. 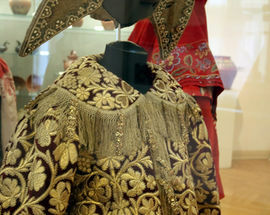 The “kokoshnik” is perhaps one of the most famous elements of the national Russian costume for women. In ancient Rus’, women didn’t wear hats because hats were for men. Instead, women wore a headdress that was even more beautiful and comfortable – the “kokoshnik”. These were made from expensive materials - silk, velvet, or brocade - and were decorated with pearls, lace, stones and embroidered gold thread. The word “kokoshnik” comes from the Slavic word “kokosh”, which meant a chicken and rooster. This ancient Russian headdress in the form of a crest (fan or round shield) has long been a symbol of Russian fashion. The shape of the kokoshnik varied greatly from region to region, but tended to depend on the particularities of the tradition of putting hair up in a harness or two braids: around the head over the forehead, on the neck, on the temples, etc. As a rule peasants had to sew clothes from their own fabrics – wool, hemp, staminate hemp and linen. Poor families could purchase garments extremely rarely and if purchases did occur, this was done in turn, by pooling together resources of several families. Even ritual garments, like wedding dresses, were only available for collective use. Dresses of the noblemen were, of course, made of expensive fabrics as well as gold, silver, pearls and expensive buttons. 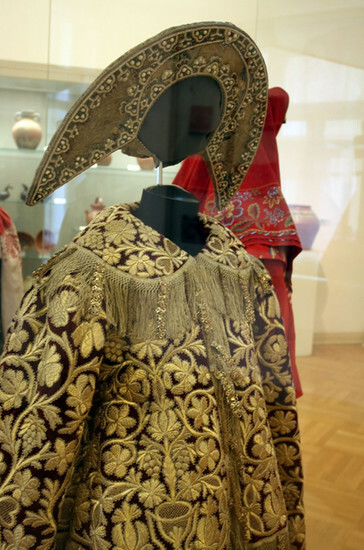 In the present day, Russia’s national costume still presents some mysteries for ethnographers and attracts the attention of art historians and fashion designers thanks to its stunning beauty.